In advance of the opening next year of its Home of Innovation facility in Riyadh, Sabic hosted representatives from 43 global, regional and local companies that are participating in the initiative. The Home of Innovation seeks to introduce industry-leading technology into Saudi Arabia and the Middle East region. The event took place at the Sabic Plastics Application Development Centre (SADC). Yousef Al Benyan, Sabic’s acting vice chairman and CEO, and Awadh Al Maker, its executive vice president, technology and innovation, welcomed the gathering. The representatives later met Sabic executives to discuss mutual goals for the Home of Innovation. Following a ceremonial signing of the participation agreements, Sabic elaborated on its vision and intent for the Home of Innovation, highlighting collaboration, targeting of opportunities and industrial growth in Saudi Arabia and the region. The event included one-to-one business meetings between Sabic and participating companies, tours of the SPADC facility, and group photo opportunities, according to a Sabic statement. Attendees received a glimpse of the Home of Innovation facility currently under construction in the Riyadh Techno Valley at King Saud University. Adjacent to SPADC, the three-building facility will serve as a focal point for the initiative and a real-world application of high-performance materials, products, and systems integration. It is expected to be completed in the first half of next year. 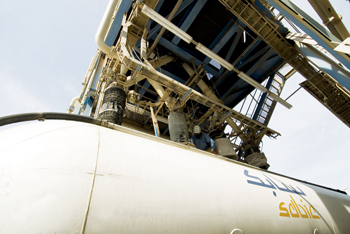 Sabic’s initiative in another field has won it laurels. A learning programme, jointly designed by Sabic and Penn State University’s Smeal College of Business for the benefit of Sabic employees, was recognised by Chief Learning Officer magazine with the 2015 Gold Award. Recognising the importance of its supply chain (SC) discipline to continued global growth, Sabic first engaged Penn State Executive Education Programmes in 2009 to develop supply chain professionals at all levels within the organisation. Sabic and Penn State University formalised their cooperation by signing a Learning Services Agreement in October of 2013. The Global Supply Chain Centre of Excellence (GSC COE), accountable for the SC Development Programme in Sabic, designed an overall learning architecture with Sabic Academy and Penn State Executive Education Programmes. The Applied Learning programme combines face-to-face learning, applied learning projects, and coaching. Selected high-performers are eligible to enrol in the online Master of Professional Studies in the Supply Chain Management Programme offered by the Smeal College of Business and Penn State’s World Campus.